So if you’ve chosen an agent (or two), you’ve found an apartment you want to look at, and scheduled your appointment… what happens next? The agent will either ask you to meet him/her at their office or at a public space (ex: coffee shop, street corner) close to the apartments they’ll be showing you. At this point, they will have most likely asked you to fill out the Fee Agreement and the Broker Disclosure Form we mentioned earlier. If they haven’t, they will at this meeting. If you have agreed to a new fee, it’s important to make sure you get the form at this point. You’ll want that change in writing (if say, their regular fee is 15% but you’ve negotiated it down to 8%). If you haven’t made any changes you don’t need to press for the forms. They are in place to protect the agent, to ensure they get payment, and there is no real need for the renter. However, when all the proper forms are signed, agents tend to be more avid in helping you find the best apartment. Once the fear that you’ll try and get the apartment without them is assuaged (legally by a contract), they will often work much harder for you. In general, apartment viewings take place during the day. Many buildings don’t allow apartment showings after 8pm as to not disturb occupants of the building. Depending on the management office/landlord, certain buildings won’t show apartments on the weekends. Each showing lasts approximately 30-40+ minutes depending on how long it takes you to travel and check out the apartment. We would advise you to block off around 3-4 hours if your agent is going to bring you to 3-4 different locations. In fast-paced rental markets like New York in particular, the best strategy is to see as many apartments as you can in one day as apartments are rented extremely fast. Spacing out your visits to apartments means you’ll have to spend more time comparing while other renters may already be making a decision on which apartments they want to apply for. If you’ll be living with someone else in the apartment, it’s best to view the apartments together. What you might view as a great apartment might not necessarily be perceived the same way by your roommate, and it slows things down if your roommate has to schedule an individual viewing after you already love the place. Key Issues: Good agents and landlords should have everything coordinated so that when you arrive at an apartment, the agent will have the keys and be ready to show you the apartment. Of course, sometimes, this isn’t the case and the agent may have the wrong key or no one is at the apartment complex to let you into the apartment unit you want to see. Busy Management Office: Depending on the season, day of the week you’re viewing an apartment, the management office may be overbooked with showing apartments. At times like this it’s good to bring a book or strike up a good conversation with the doorman or residents of the building to find out more information about the building. It’s easy to be overwhelmed when checking out an apartment in person. Here’s a list of things you should be looking out for! Don’t hold back from asking your agent any questions. Either they know the answer already or they’ll be able to find out for you. Be sure to pay close attention to the space of the apartment. You’ll need to be able to envision yourself living in such a space and if you can start planning ahead to see how all your prize collections will fit into the new space, that’s a good sign for the apartment. Be creative! If the agents with you or current tenant in the apartment space is okay with it, be sure to take plenty of pictures of the apartment so that you can have images for reference later on. As you visit more and more apartments, details will begin to blur! Similarly, also be sure to take notes during your visit. 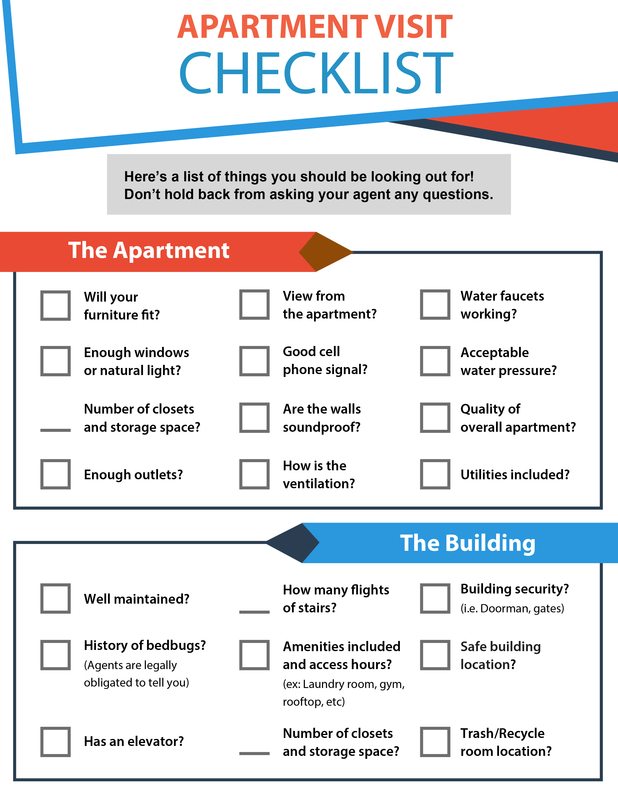 Take your time and write down details that really stood out to you when you visited the apartment. A quick and simple pros and cons list will do! Pay attention to your first reaction when you walked in. If the current residents are still living in the apartment, be sure to ask for permission to take pictures before you do so. And if they’re willing, ask some questions about the apartment and the building. Don’t forget to be respectful — it can be uncomfortable for everyone if the apartment is occupied. Respect the current tenant’s space and time.